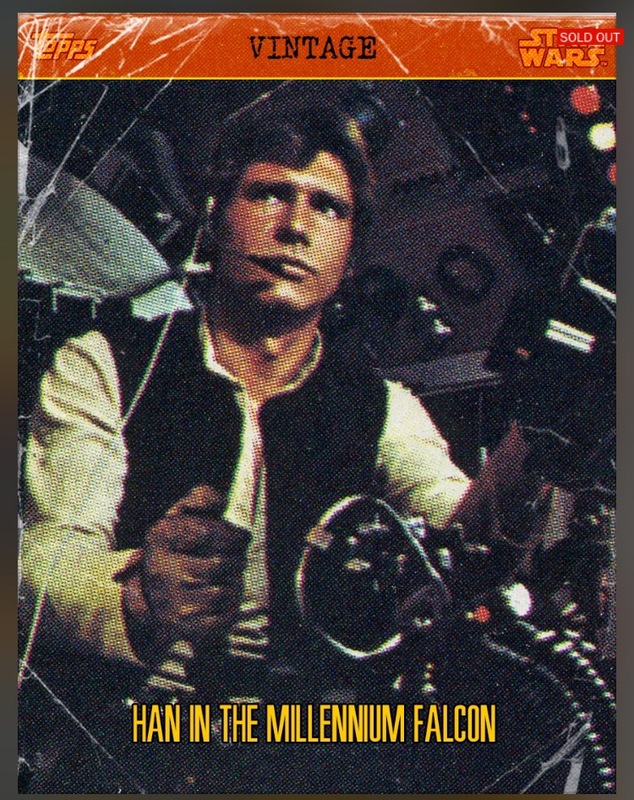 Welcome to MakingStarWars.net’s weekly Star Wars Card Trader Round-Up #10 for the week of September 21st through September 27th. We’re going to do something a little different for our 10th column. Each of us are going to detail what our favorite sets are. Yes, there were new sets like Die Cut, Yavin and Build A Ship. Yes some awards are coming, but we wanted to take the opportunity to share with you some of the sets we love so you can get a sense of who we are through that. Is there any doubt that my favorite sets are Locations and the favorite of all those is the Hoth Set? Posters comes a close second, but the Hoth set has an AT-AT and that’s all you really need to know. This was one of the earliest card sets released by Star Wars Card Trader and surprisingly, has three awards. They followed this set with a Geonosis set shortly after with three awards as well. There have been quite a few locations sets after those two, including Dagobah, Bespin and Naboo among others, but what sets Hoth and Geonosis apart are the Planet Awards. It was pretty cool to get an award of the planet and for whatever reason, Topps discontinued that. It would be awesome if they could bring these back in some way, even if it’s in its own set. Locations sets provide you with characters and vehicles that aren’t in any other base card and I think that’s one of the reasons they retain their popularity, especially Hoth. If you are interested in collecting these sets, start with Hoth as those card are getting harder and harder to trade for. Of all the great sets in this app to chase, my favorite has been Vintage. Everything about it screams old school to me (Editor: especially the name!). From watching the OT on my old VHS tapes, to my personal collection of actual Star Wars cards. Books upon books, with pages upon pages, of these very images brings a nostalgia to me that makes it enjoyable and worth the chase. The image selections are sometimes a hit or sometimes a miss, but you can’t go wrong with the look. I love the fact that these cards look like they’ve been thumbed through, stuck in the spokes of your front bike tire, or just stored away for a long period of time. Some don’t like the beat up look and that’s ok. It can be frustrating at times to chase this. You can either burn through your credits in a hurry with no luck, not pull it and have to trade for it, or you can sit down, open your first Boba pack and get it on your second card. They hold a pretty decent value over time and make GREAT trade bait for pretty much any marathon. With the current set coming to a close on Oct 1st, I am eager to see where Topps take the next marathon Vintage chase. Will they change up the look? Make the odds a bit easier for the newer users that come along or will they stick with what’s working and don’t fix it if it isn’t broken. Have a good week pulling. My favorite set thus far is also one of the earlier ones – The Jedi/Sith Warriors. This set actually hooked me on the Card Trader app. To that point I hadn’t had much focus on my collecting beyond the somewhat disappointing Shadowbox set. I even considered dropping the app all-together as it just wasn’t that much fun. However, when this set came along it really got my collecting blood pumping. I’m a huge fan of the Jedi vs. Sith storyline in the saga itself and this set spoke to me. The background was simple, yet stunning and extremely appropriate. These cards look like the Force is literally coming through them. 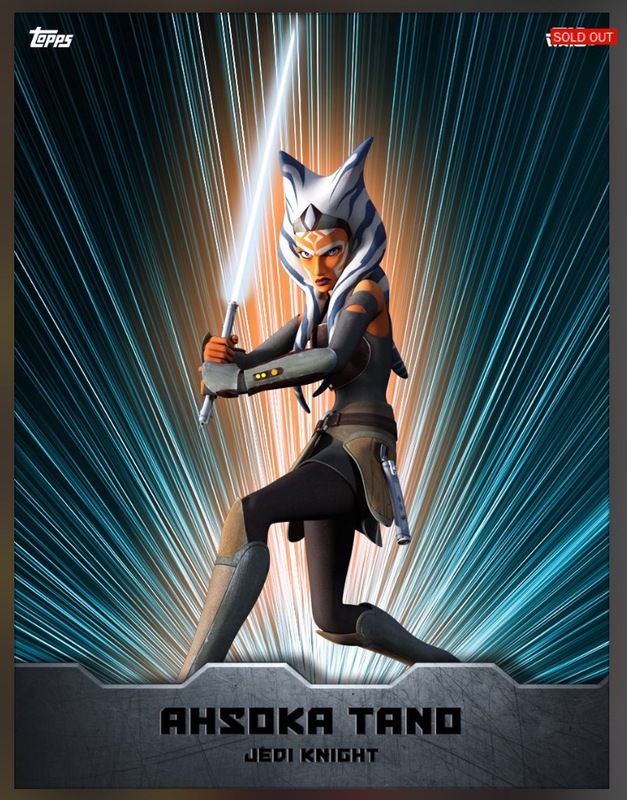 This set also features one of the earliest Rebels Ahsoka cards, which remains one of the coolest cards in the app. I really wish we would get a continuation of this set. It hasn’t even been a year since Star Wars Card Trader started and who knows how long these will be our favorite sets. Topps has been cranking out some fantastic Force Awakens cards and if they keep it, we may all change our minds before the next column. Feel free to get at us on Twitter and let us know your favorite sets. We are curious as to what and why everyone chases and collects.